Yardage - Whole Yards Only Note ! If you need more than the 43 Yards we currently have in stock, please make a different selection as additional yardage is not available. 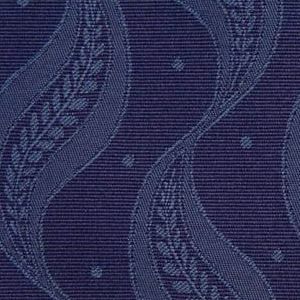 In stock yardage is typically shipped within 2 business days. Avora Blend Ensign is a woven, contemporary floral design with a ribbon effect shown in Sky Blue against a Federal Blue background. The size of the swirling leaf is approximately four inches by one and three quarter inches. The overall pattern repeat is Vertical 4.125 inches and Horizontal 3.625 inches. With excellent durability, this fabric can be utilized in Hospitality, Health Care, Educational, Corporate and Residential settings where high traffic is a consideration. Avora is suitable for draperies, curtains, cornice boards, pillows, cushions, headboards and furniture upholstery.